“You have to know the dirty tricks, there are dirty tricks”. So says Claude Pariset an antiques dealer from Champagne, discussing the art trade in the New York Times yesterday. A number of recent stories of this ilk continue to show why the auction house system of the sale of art and antiquities, with its anonymous sellers and buyers has had devastating consequences on our heritage. As I’ve argued, these auction houses play an important role in the market, know exactly what they are doing, and yet the anonymity continues to shield their practices, and allow for the sale of looted and stolen pieces of heritage. First, an update on the wrongdoing at the Hôtel Drouot auction house in Paris. Late last year French authorities had uncovered stolen artworks, and an art-trafficking network. Now there are further reports of corruption, including faking bids, collusion to keep prices down, and theft as well. This comes as Bonham’s auction house tries to find some antiquities to sell in its auction today. It has withdrawn a marble statue which was included amongst the notorious Medici polaroids. It has also withdrawn some Roman funerary sculptures that bore signs that they had recently been illegally excavated, pictured above. An Anglo-Saxon stone was also removed from auction. After concerned authorities and archaeologists contacted Bonham’s, these objects have all been withdrawn from auction. But that does not mean they won’t be sold again privately, and does not mean that we know who the sellers were. Scott Sayare, Chatter of Swindles and Scams at Auction House, The New York Times, April 26, 2010. 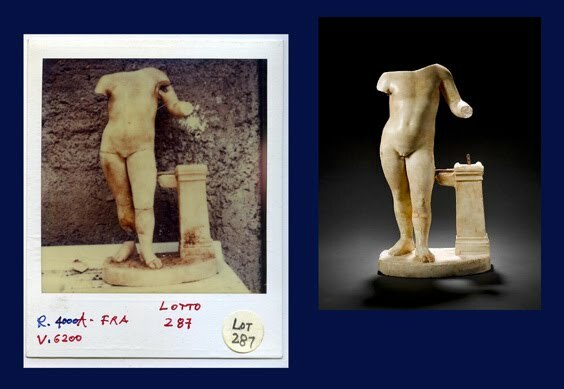 Dalya Alberge, Roman sculptures withdrawn from auction amid fears they are stolen, The Guardian, April 27, 2010. Mike Pitts, Save our Anglo-Saxon stone!, The Guardian, April 24, 2010. The composite pictures are derived from Looting Matters.